The WaterBasics™ RED Line Filtered Water Bottle is the perfect way to enjoy great tasting, filtered water with just a squeeze and a sip. The simple to use design makes it easy to have fresh, clean, filtered water at home, at the office, in the gym, or for all kinds of outdoor and travel activities. When you drink from a WaterBasics RED Line Filtered Water Bottle, you are assured of a thoroughly tested and proven level of biological protection that includes protection from virus, bacteria, protozoans and chemical and biological toxins. 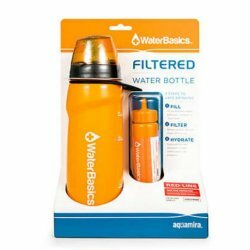 WaterBasics™ RED Line Replacement Filters with Mixed Media Filtration Technology take advantage of a unique combination of the most advanced filtration materials and media science available today. Using a patent pending filter design and manufacturing method, Aquamira engineers have created a multi-stage filtration system that incorporates the power of electropositive charge differential to "pull" particles as small as viruses out of the water stream while still maintaining high flow. This technology has been thoroughly tested and proven effective by independent laboratories to consistently remove protozoan cysts, bacteria, and virus to ANSI/NSF Standard 53, and US EPA standards without the need for cumbersome "back-flushing" requirements or disinfecting chemicals such as chlorine, bromine, or iodine. 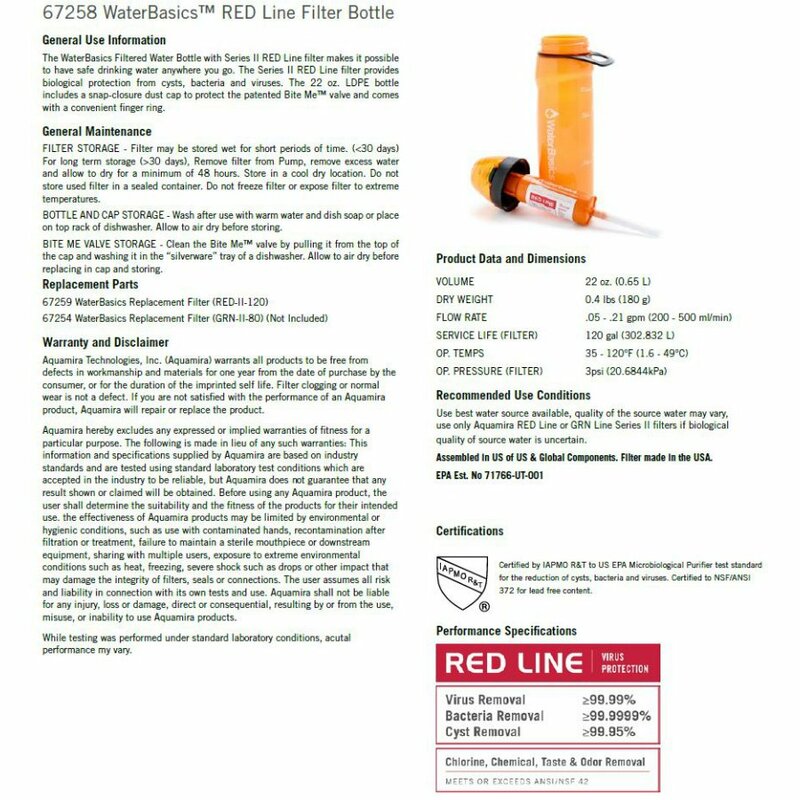 WaterBasics RED Line patent pending carbon block sleeve design increases the absorptive capability required to reduce harmful chemicals, bad tastes and odors, to ANSI/NSF Standard 42 requirements, and have been tested and proven effective in reducing Cyanotoxins such as Microcystin and other biotoxins. 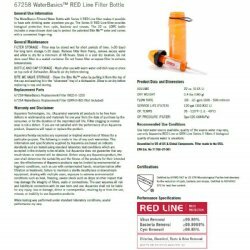 WaterBasics RED Line filters assure maximum protection in high risk applications, while providing high flows and long service life in the most compact, lightweight cartridge available today. We understand connectivity. WaterBasics Series II filters connect easily to any WaterBasics water bottle cap, storage or filtration kits and pump. 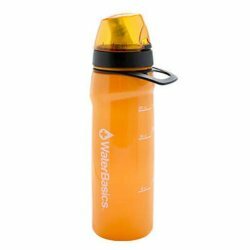 They also connect easily to most standard water storage containers. Fewer fittings means one filter is all you need to provide the maximum protection for you and your family without worrying about "will it fit?"